If you have been following me since my debut, you would know that Jojo’s Bizzare Adventure is one of my favorite series ever. Stardust Crusaders was part of Top 5 of 2015 series, while Diamond is Unbreakable was part of my Top 5 series of 2016, as well as my favorite Jojo part. Additionally, I also had the opportunity to review the first volume of Stardust Crusaders which you can find here. While the series has been available in English since last year via Adult Swim, we just recently got the Blu-Ray set which in packaged in an amazing looking box. 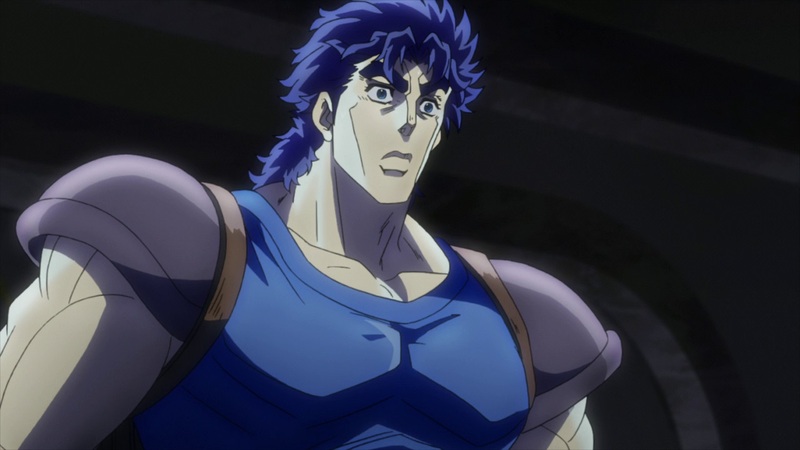 The Blu-ray set only includes season one, which covers both the Phantom Blood arc, featuring Jonathan Joestar, and Battle Tendency, featuring his grandson Joseph Joestar. Let’s get straight to the point. While we all enjoyed Phantom Blood because it’s the foundation of one of the greatest Shonen series of all time, a lot of the fandom puts it in the bottom of their list list, including myself. Battle Tendency is also in the bottom for me alongside Vento Aureo, though Giorno is best Jojo, but I digress. Phantom Blood starts with George Joestar, Jonathan’s father was part of a carriage accident along his wife Mary and an infant Jonathan. While both George and Jonathan survived, Mary unfortunately died. Later on, George was saved by Dario Brando, who is the father of Dio Brando, the main antagonist of the series. Mistaking Dario as a rescuer, George feels indebted to him. Twelve years has passed since the incident, so after receiving a letter from a dying Dario, George honors his "debt" by allowing Dario's son Dio Brando to live at the Joestar Mansion and accepts him unconditionally as his own son. Immediately, Dio and Jonathan turn into enemies as Dio attempts to make George hate Jonathan so Dio comes the heir of his fortune. Throughout the series Dio makes Jonathan’s life impossible and makes everyone turn against him. The series takes a darker turn when the Stone Mask is introduced, however. Whoever puts on the Stone Mark is granted a terrible power at the cost of a vampire curse. With the help of Zeppeli, Jonathan learns Hamon, an energy used in the ancient form of martial arts, Sendo. It’s a power that can be used through self-controlled respiration, allowing the person to produce an energy manifesting as ripples throughout the body and identical to the energy of the Sun. Even though Phantom Blood is one of the shortest parts, being 44 chapters total, it skipped a lot of content. Phantom Blood only covered 9 episodes of the first season, with the remaining of the series covers Battle Tendency. Though the content skipped is mostly fluff and nothing imperative that will hinder your experience. Battle Tendency is 69 chapters, which was covered in 17 episodes of the first season. My memory of the Battle Tendencymanga is blurry but it felt like it went a normal pace. Even though it’s one of my least favorite parts, Battle Tendency was very enjoyable. Joseph Joestar was a more enjoyable Jojo compared to his grandfather, especially his chemistry with his comrade Caesar Zeppeli, not to mention, the Piller Men were more interesting villains compared to Dio, especially both Wamuu and Esidisi. I wasn’t really a big fan of Kars though, the main villain of Battle Tendency. I really tried to give the English dub a chance, but I couldn’t tolerate it. 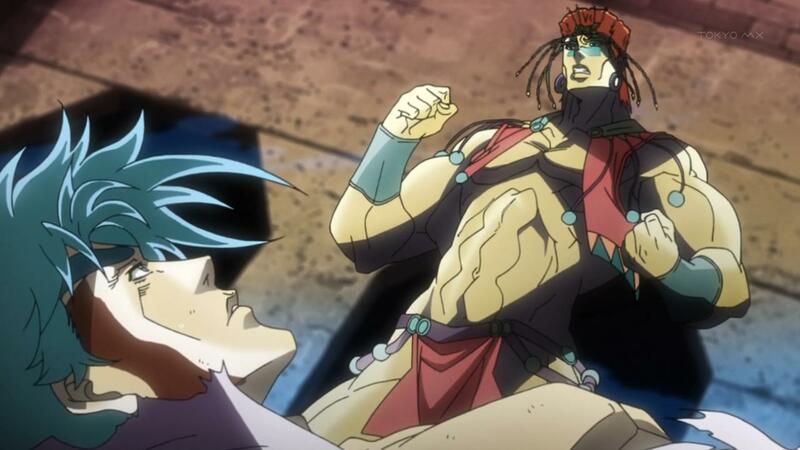 Joseph doesn’t as epic as he should, especially with that higher pitch voice, and Caesar with an accent that didn’t remotely sound Italian was kind of cringe. Same applies to the Phantom Blood dub, where the English accents were attempted but they sounded force. I get they were trying to match the setting but neutral English should have been enough. If you’re a fan of Jojo’s Bizarre Adventure, you should definitely invest in the limited edition Blu-ray set. The packaging is amazing, the key animation collection booklet is very interesting, and the art cards are good collectibles as well.